YEAH! I have tried for several years to grow watermelons with no success. Yesterday, in addition to harvesting literally about 30 pounds of tomatoes, I went to check on my babies. There were four that were ready!!!! Hubby and I sampled some early this morning after letting it cool in the fridge over night and oh how sweet it is!! Each one of those babies weighs a good 20 pounds! You should have seen my daughter and I struggling to carry these things to the car! It was definitely funny! I kid you not when I say that each of those bags weighed as much as one of the watermelons! I was afraid that the plastic bag was going to break! 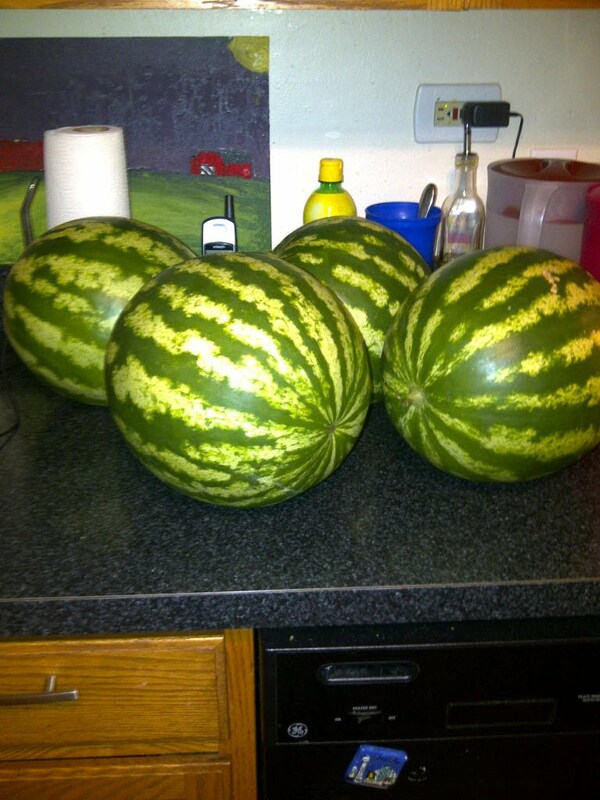 I’m so proud and feel so very blessed to have grown my very own watermelons! I think my Grandpa is up in Heaven smiling down on my harvest. 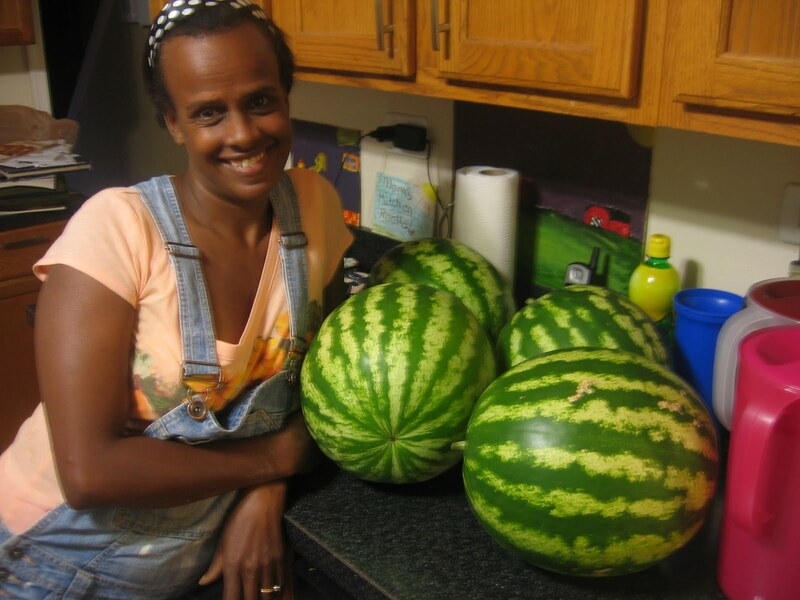 There are still about ten watermelons left in the garden that should be ready within the next week or two. 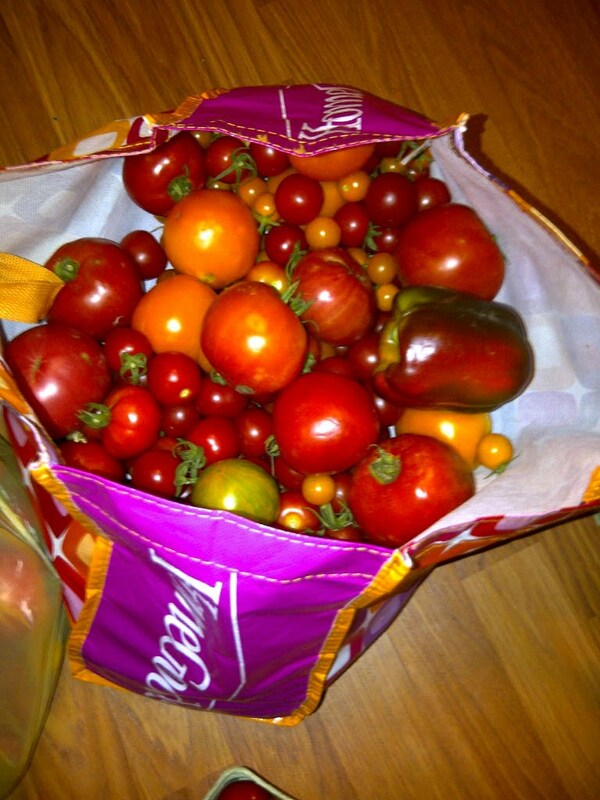 Now I’m going to figure out what to do with all those maters! So what are you going to do with all those beauties? Wow, that's quite a harvest. Nothing better than a few slices of ice cold watermelon on a hot summer day. I'm going to plant watermelon next season. Hope I'm as lucky as you. Congratulations! They look beautiful! Are you going to try picking the rinf or making candy out of it? 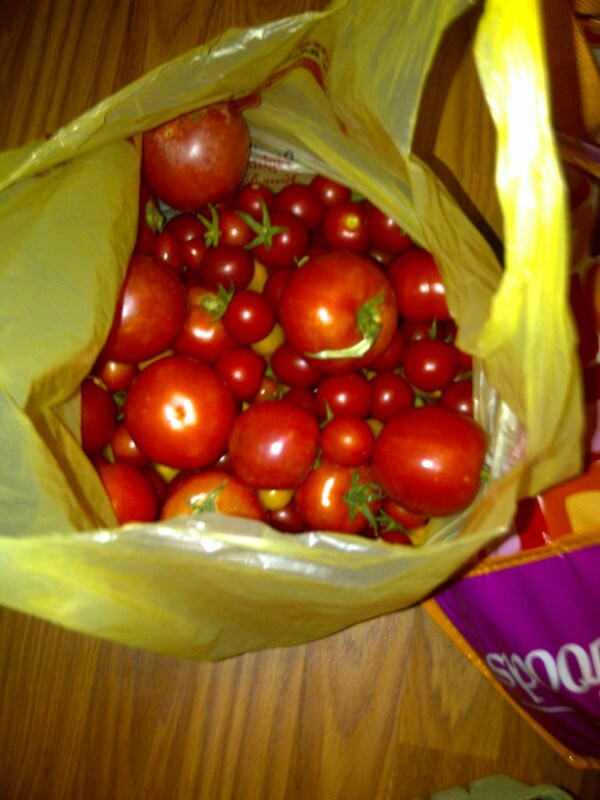 Nancy…I made some homemade spaghetti sauce last night with a bunch of the big maters. I took piks and will blog about it. I've been giving them away left and right and eating them too! Rmgales…I hope you are too! This is the first time I was successful and I am so glad! Christine….I've never heard of that. We are just eating them and they are so sweet! Congratulations! Your watermelons are beautiful! I would love to grow some but haven't found a variety that is square–so they won't roll down our hill from the garden! Congrats on your watermelon. I planted two sugar baby plants which produced 4 or 5 watermelons total. The weeds got pretty gnarly and tangled up in the watermelon vines. I cleared all the weeds out and am hoping that the melons survive and are tasty. I will probably pick in a few weeks. Thanks, Brian! I've gotten eight so far and they are all twenty pounders and if all goes well there will be about six more to harvest. A few of them did split wide open and I am not sure why. But I'm so thankful for the ones I've gotten so far! Congrats!! I believe the splitting problem is usually caused by uneven watering, which it's hard to avoid in this weather – but hurray, you got lots that didn't split! Can you tell us how you decide the melons are ripe? That can be a tough call. Any tips on what you did differently with the watermelons this year compared to the previous years? I'd also like to know what you did differently this year. Erica…I know the melons are ripe when they have that yellow spot on the bottom and when I tap them it sounds like a hollow drum. Works every time! What I did differently was I grew in a 5,000 square foot garden and gave them their own bed to be free to sprawl in. In previous years I tried to grow them in my 300 square foot garden…and honestly that's the only difference. I guess my granpa was right….melons like LOTS of space to sprawl in. I picked a melon last night and it was delicious. It was a little smaller than expected, but it was ripe because it had the yellow spot on the bottom and it had been 80 days since I transplanted. My oldest son couldn't stop eating it at dinner and even drank the watermelon juice from the bottom of the bowl!